Yellowstone’s bison issue stems from problems related to brucellosis, migration, and people. Though complex, solutions to this issue might include changes to policies, vaccinations, migration lanes, informational campaigns, and elevated boardwalks. The bison in the park need to migrate freely in order to get out of harsh weather conditions and feed on the grasslands. The public is under the illusion that bison naturally live in the park year round, and that is simply not true. Dr. Shane Doyle, a member of the Crow Tribe and Native American historian, stated, “The bison aren’t naturally from the park. They are from the grasslands north of the park.” This means that the bison are from the grasslands in Montana where they have migrated for thousands of years to graze. Naturally, bison should leave the park in the winter months still so they can reach the grazing lands. Today, the bison are prohibited from migrating out of the park and slaughtered if they do leave in order to prevent the spread of brucellosis and the intrusion on Montana cattle land. But according to research done by Emily Davies of the University of Colorado, “there are no documented cases of wild bison spreading the disease to cattle, cattlemen support the shootings as they seek to preserve Montana’s brucellosis-free status for the sake of their livelihoods and the state economy.” Also, the Centers for Disease Control stated that “Seventeen instances of brucellosis transmission from elk to livestock were reported during the last decade.” This means that in the last decade all of the reports of brucellosis being spread to cattle have been from elk not bison. We need to give bison the proper amount of space to migrate in order to live naturally and to have a healthy population. Brucellosis causes bison to abort their young, which affects their ability to reproduce. In order to solve this problem, we should vaccinate all the bison in the park. We talked to Ranger Jon Nicholson during our time at the park, and he stated that vaccinating the bison is a good idea, but it’s a very expensive idea as well. Although, the expense would be compensated in the long run because then we wouldn’t have to annually spend money for slaughtering and relocating the bison. Human interaction is a growing problem with bison in Yellowstone National Park. In the past few years there have been many reports of human interaction and domestication. People get into close quarters with the animals. Two men put a bison calf in the back of their car last year. There are a few proposed solutions to this problem like adding fence around the boardwalk or raising the boardwalk above the bison’s path. These solutions also pose possible problems. In regard the fence idea, it would be interfering with the bison’s natural migration patterns and interrupt their access to the thermal hotspots, where they get heat in the winter. The elevated boardwalk idea would have construction crews. Which would harm the ground underneath the boardwalks. The boardwalks could also limit the migration of the bison. Once we fix these problems, bison will start to behave more naturally. All these problems tie together because of brucellosis; however, people problems in the park cause discomfort to bison which disrupts their migration patterns. We need to take action starting by vaccinating the bison. Once we solve brucellosis, we will have more ability to open up the lands north of the park to migration. The federal government could do this by buying ranchland and turning it into places for the bison to migrate in the winter months. 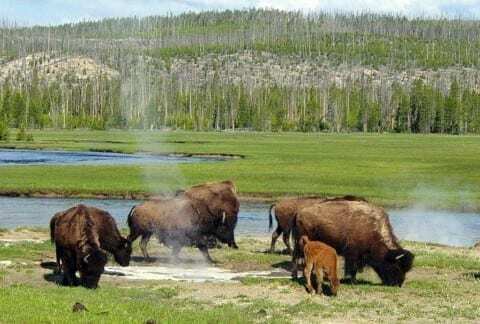 As we cure the bison of brucellosis and give them more land to migrate, YNP needs to educate the visitors about the dangers of bison and enforce park policy. When these problems are solved, the bison will live comfortably and healthy. Bison Migration Issues by Haylee is licensed under a Creative Commons Attribution-ShareAlike 4.0 International License.